On Saturday, Jan. 26, the seventh grade Apaches took on Great Bend and Hays. Against Great Bend the Apaches struggled to score and had many lapses on defense leading to a 9-36 defeat. Seymour Rogers then took on Hays. The Apaches scored 2 points in the first quarter. In the following quarter, they scored 12 points, but were not able to overcome Hays, as the final was Seymour Rogers 17, Hays 44. 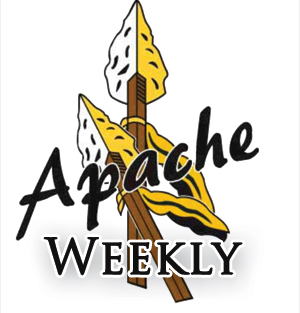 The Seymour Rogers Apaches played a tough game against the Dodge City Cardinals last week on January 17. Dodge started the game with a 6-0 run before SRMS got on the board. The score was 8-6 Dodge after the first quarter. Liberal fought back and led 13-12 at the half. Dodge came out strong in the third and held SRMS to only one point in the quarter. The Cardinals led 20-14 after three. Both teams kept battling and the game ended in favor of Dodge City, 24-33. Jovanni Garcia was the leading scorer for the Apaches with 9 points. The seventh grade A-Team falls to 0-2.